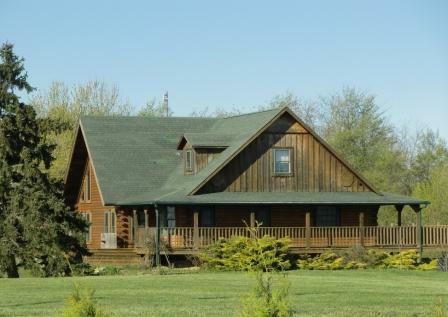 I have a small collection of photos of log homes. This page will vary over time as I may move some photos elsewhere or as I add sections. Some of these photos will have some text associated with them and some will not. This home is on my way to town. 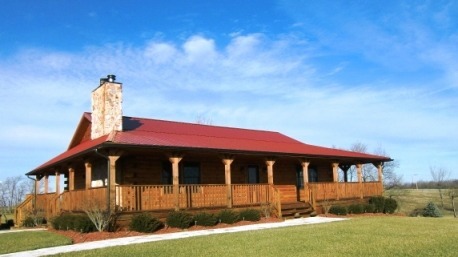 It was built in 2008 by an Amish builder using cedars harvested in Holmes County. Holmes County has the highest concentration of Amish in Ohio, although we have areas in Logan County where there a quite a few. 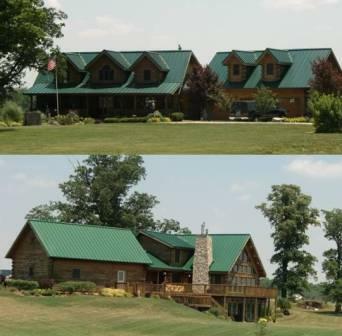 The owner, Gary Zucker, told me that the builder, Amos Kinrige out of Mount Victory, Ohio built it for $100,000 less than the log home companies were charging. 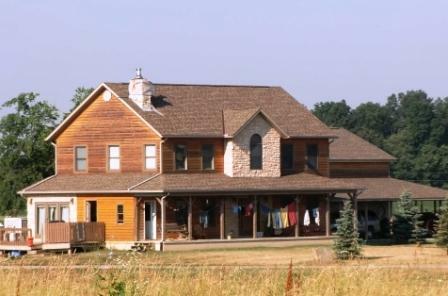 It is a fairly simple house, but with an awesome wrap-around porch. What are the chances that Amos will link to me from his website? Gary has a real gem here, and he is lucky that he also has a real bargain. Good job, Gary (and Amos). 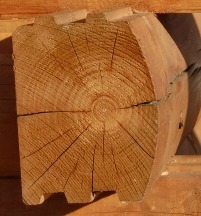 Here is a close-up of the logs. They are milled with a D profile and butted at the ends rather than notched. Look at the end of the log. A crack goes from the outside to the heartwood. Another comes in from the inside to the heartwood. They don't actually join, but they do represent a place where the insulation value of the wood will be lower. 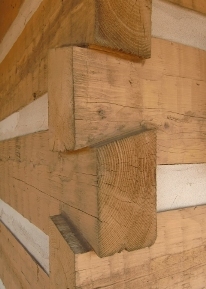 This is normal with log homes. In Gary's case the porch cover provides protection from that type of damage. You can fill in the cracks, but they do keep growing. If these logs were exposed to the weather and water dripped into the crack and stayed there you could have a problem, either with swelling or rot. 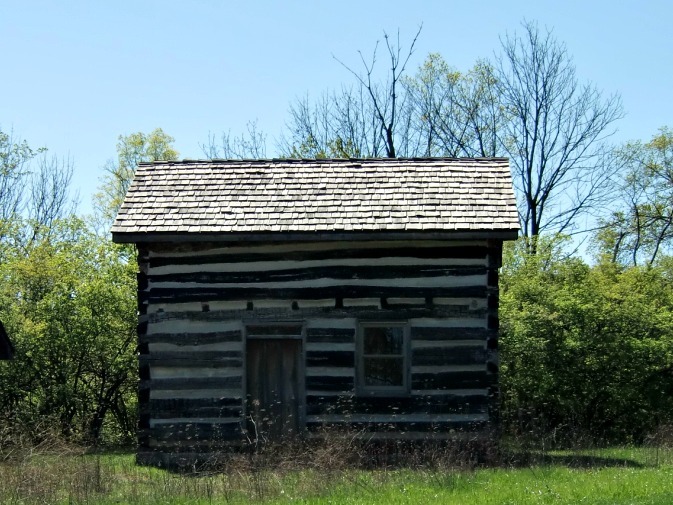 This is a reconstruction of a home by Ebenezer Zane, son of Isaac Zane and Princess Myeerah. Myeerah was Chief Tarhe's daughter. He ran the Wyandote village located where the town of Zanesfield now stands. As I recall the story, Isaac Zane was captured by Indians but was eventually adopted into this tribe. 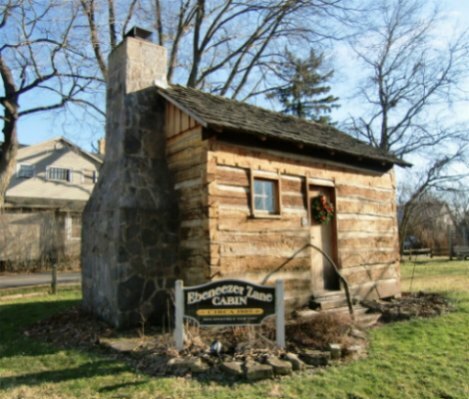 It gives you an idea of how a cabin on the frontier would have looked like. This home south of Bellefontaine looks like it was build 200 years ago, except for the modern windows. 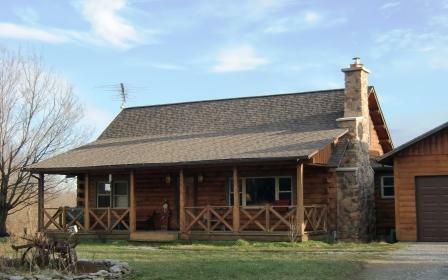 I don't know how many log cabins had wrap-around porches, but if they did they must have looked something like this. 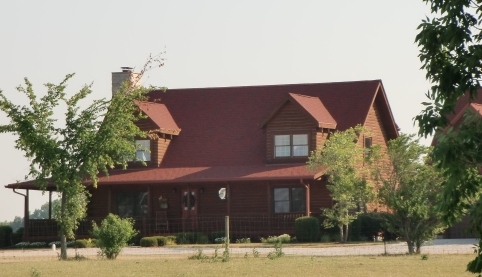 This is a high-quality home with a price tag to match. The stone work is excellent. The stone foundation under the porch is a nice touch that adds just a little bit of extra. It tells you that the house was built solid and has a good foundation. Of course that is mostly show since the real foundation is on the other side of the porch, but it is an important show. It adds to the aesthetic appeal of the house. Check out this side view. Look at those chimneys. There is even more below. Its on a hill and there is a walk out basement that you can't see here. If there is a complaint I'd have about this house it is that it is a little too perfect. 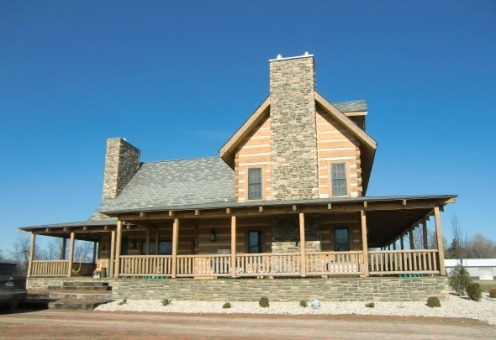 It is rustic, but the stonework and the chinking is so perfect that you know it was built a couple of year ago. That is no major problem, since the quality also give you a comforting feeling, knowing that it was well built and you won't have drafts blowing through crumbling mortar. I have included a couple of close-up shots. 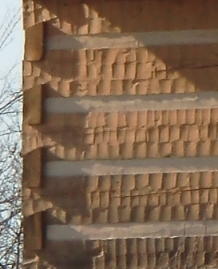 Note the rough hewn look. This is a major improvement over milled logs. It adds texture, character and interest. 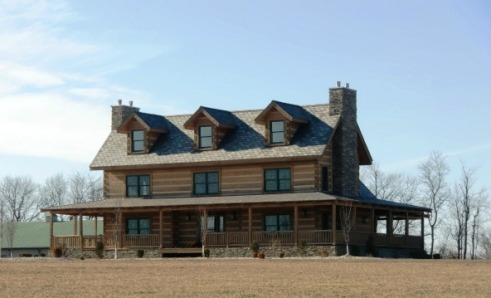 Milled log homes can be very nice, but this is better. The wide chinking was an aesthetic choice. You can certainly make houses without it, but in going for this look they made it look old, while also adding visual interest because of the alternating bands of color. The house below belongs to a friend and co-worker, John Morris. You are looking at the front and the back. 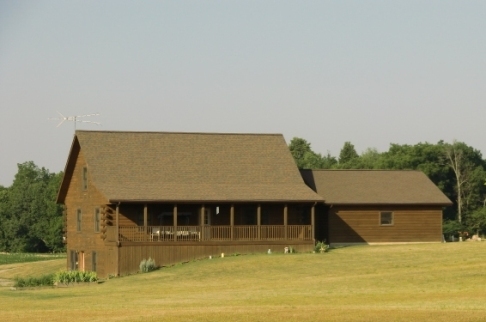 It overlooks a pond and fits right in to its rural surroundings. The next several photos are all homes in my area or which I have discovered during my travels. I have no special knowledge to add about these homes. Enjoy the pics! 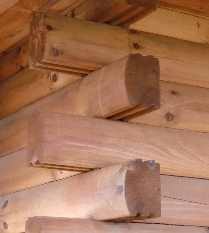 If my limited library is insufficient, consider these log homes. What is your favorite Alternative? Have you built one an Alternative house? Do you want to? Tell us what you think! Tell me I'm crazy! Whatever, just join the conversation by entering a comment below.